The U.S. House of Representatives on Monday passed by voice vote legislation that would protect the Boulder and White Cloud mountains as wilderness. 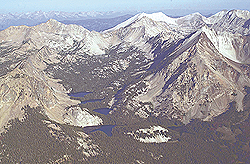 The high peaks of the White Clouds, pictured, are renowned for their scenic and wild character. Express file photo. Gubernatorial candidate says property taxes ?hottest issue of election? Are Friedman night flights in danger? Presented by Suns Foundation Inc.